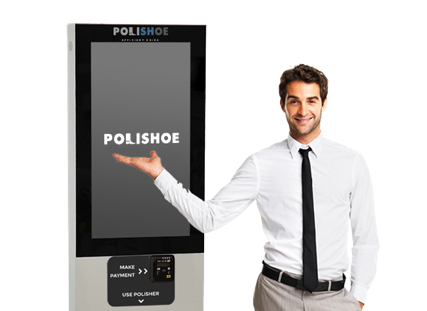 Polishoe is an innovative kiosk-style product offering customers a free three-step shoe polish in just under two minutes, as they watch instructions and a few ads. The stand-alone machine features a place to put the shoe being polished, beneath a 32-inch screen. It requires little space, taking up 52 x 62 cm, and needs standard power and access to wi-fi. Venues owning a unit may charge for the service, but otherwise the person getting each shoe polished is presented with a video that explains the polish process, then some advertising. The advertising loop includes non-competing third parties, and some for the venue, likely showing promotions or upcoming events. Smart Solutions offers the machines through a variety of agreements, most commonly on a six-month trial that is free to the venue. For hosting the machine the venue receives either two 15-second or one 30-second slot in the ad loop. A greater share of voice can be negotiated with higher agreements. Patrons getting the service for free scan a code on the machine to activate the machine, or the process can be charged using paywave, typically for $5-10. The company reports the Polishoe system has seen considerable success overseas, particularly with the hospitality and events markets. “Venues can bring the shoe polish service into their venues as a free value-add for their patrons at no cost to them,” suggests Smart Solutions’ Erik Bigalk.